Be the first to share your favorite memory, photo or story of Quilla. This memorial page is dedicated for family, friends and future generations to celebrate the life of their loved one. 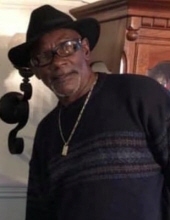 Quilla Marsh Moore, 63 of Abilene formerly of Stamford passed away Tuesday, April 2, 2019 at Hendrick Medical Center. Funeral service will be held 2:00 p.m. Saturday, April 13, 2019 at the First Baptist Church in Stamford with the Rev. Jeffrey Andrews officiating. Burial will follow in the Highland Memorial Cemetery in Stamford. Quilla was born October 7, 1955 in Stamford, the son of the late Square Marsh and Jewel Moore. He married Deborah Gee in 1973 in Abilene. He lived in Stamford until moving to Abilene in 1973. Quilla worked as a mechanic and his passion was being with the family he loved dearly. He was known for his perfect smile that he shared with everyone. He was preceded in death by his parents, one daughter Latwanda Moore and one brother Elton Moore Jr..
Quilla leaves behind his wife Deborah Gee ; 3 sons Myland Moore and wife Marsha, Andre Moore, Richard Moore all of Abilene; 2 daughters Tonya Nicole Smith of Lewisville; Shamon Cooper of Odessa; 2 brothers Richard Moore and wife Shirley of Stamford; Ernest Moore and wife Brenda of Sherman; 2 sisters Barbara Andrews and husband Billy of Abilene; Louise Griggs of Stamford; Grandchildren Mi'laun Moore, Myland Moore Jr., Marquarious Moore, Na'Dayeshia Norman, Camdyn Mayes, La'Trell Batiste, Anzeleigha Moore, Riccardo Moore, Shamaki Cooper, Shavaris Cooper; numerous nieces, nephews and cousins. To send flowers or a remembrance gift to the family of Quilla Marsh Moore, please visit our Tribute Store. "Email Address" would like to share the life celebration of Quilla Marsh Moore. Click on the "link" to go to share a favorite memory or leave a condolence message for the family.